Jon – Page 2 – Carpe Diem Systems Ltd. I had a Windows 10 VM, managed using VMWare Workstation Pro 12. The VM was originally created with the default 60GB hard disk. I needed to expand the disk, so I shutdown the VM, removed all snapshots, expanded the virtual HD to 120GB, and rebooted the VM. The plan was to use Windows 10’s disk management tool to expand the original partition and merge in the new partition. I found the basics of how to fix this on the VMWare knowledge base. I’m adding my procedure here because it includes some useful screenshots. At last, a single 120GB partition. I have an application that presents various TimeSpan properties to a user. The default string conversion isn’t great, in fact for anything other than hh:mm:ss it isn’t intuitive. After a little noodling I found some articles that helped me put together something better (at least for me!). The new SQLite-based database engine is now being used by default. I inadvertently added the file to my local git repository and then committed the changes. (I did the same thing on a couple of other projects, and made several more modifications and commits afterward). The problem is, this file shouldn’t be in git, especially because it is around 150MB ! Failed to push to the remote repository. See the Output window for more details. Error encountered while pushing to the remote repository: Error while copying content to a stream. Unable to read data from the transport connection: The connection was closed. After a bit of googling I found I had to resort to the nuclear option to fix the problem.. deleting the file from the local git commit history. 2. Note the parent commit ID of the first commit that included the new file (shown above, 645faa8c), then close VS2015. 5. I then edited my .gitignore file and added *.VC.db, then committed this mod and finally checked everything synchronized.. all worked as expected ! This occurs fairly commonly. Someone accidentally commits a huge binary file with a thoughtless git add ., and you want to remove it everywhere. This was only an issue because I was using the static OpenCV libraries rather than the pre-built binaries. It looks like VS2015 is quite happy using the VC12 OpenCV binaries. 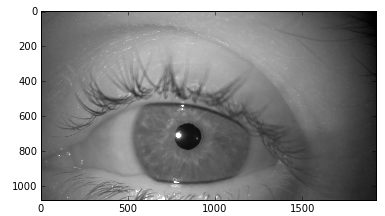 Static and Shared OpenCV libraries. Debuggable static libraries by having the correct combination of source code, libraries and PDBs. Install CMake, a build configuration tool. This assumes you have VS2015 and the latest Git for Windows. The trick, at least for me, is to clone into a folder that will be used to keep the OpenCV source code. This folder won’t get deleted during the steps below. I’m also only interested in the official latest release, which at the time of writing is version 3.0.0. I have a standard development folder structure which is currently based on c:\dev, and I have a standard sub-folder structure for all third party libraries, c:\dev\ThirdParty. So I’m going to put OpenCV into c:\dev\ThirdParty\OpenCV3.0.0. Run a git bash shell (from any folder) and clone version 3.0.0. Note the use of forward slashes in both paths ! remote: Counting objects: 183285, done. Receiving objects: 100% (183285/183285), 419.28 MiB | 3.54 MiB/s, done. Resolving deltas: 100% (124890/124890), done. Checking out files: 100% (4656/4656), done. There isn’t a VS2015 solution bundled with the OpenCV download so you must create one. This is made easy by using CMake, a cross-platform build utility. Download and install from here – I used the Windows (Win32 Installer) ‘cmake-3.4.1-win32-x86.exe’, and kept the default installation options. Run CMake and set the source code folder. Then choose a folder for the build. Make sure the build folder doesn’t already exist. E.g. For the remaining 3 VS2015 solutions first change the build path, click Configure, apply the settings, and click Generate. Give it a minute or two for the parsing stage to complete, select the Debug|Win32 configuration, and build the solution. Now switch to the Release|Win32 configuration, build the solution, and build the CMakeTargets/INSTALL project. This will add the opencv_world release DLL to the install folder. Open the Property Pages (right-click and select Properties). Hit OK to apply the changes and close the Property Pages. Instead of producing .lib and .pdb files we now have the PDB information merged into the .lib. It solves the problem of the debug build PDBs not having different names from the release equivalents. The CMakeTargets/INSTALL project doesn’t copy the PDBs, meaning a further manual step would be required to find the PDBs and copy them to the install folder. Is there a better way – I’m sure there is, but this is quite simple and quick and if it works then why not ? (One good reason to not use this approach is if you’re going to work on the OpenCV source code; using the C7 option takes away certain compiler and linker options that could make for much faster builds). There’s plenty of discussion on the web about this, for example on StackOverflow. Repeat the previous build procedure to get the Debug and Release builds and INSTALLs done. Then repeat again for the x64 (remembering to modify the Debug Information Format settings first). Then copy the contents of each of the install folders into the above build folder. Skip over duplicate files. All four of the build_XXX folders can now be deleted – for me they take up around 10GB. Alternatively you can reload each solution, select Batch Build, Select All, then clean. This drops the folders down to around 2GB. For me I’m going to ZIP and archive them, in case I made a mistake ! One of my requirements is to make sure colleagues can work with these libraries, even if they use a different folder structure to me for their own projects. The only prerequisite is that there’s a ThirdParty\OpenCV3.0.0 folder; but ThirdParty can be anywhere. My first trick is to make a User Macro in VS2015 to set the ThirdParty folder location. This is another example of something that could probably be done better, but I don’t want to change the system PATH and I need something simple. My reference for User Macros is from this MSDN page. Open or create a C++ project. Apply the changes and close the dialog, then close the Property Manager. The macro can now be used in projects which may be distributed among other developers; each developer just needs to have their ThirdParty folder (with OpenCV3.0.0 inside) and this macro. Then try setting a breakpoint on some OpenCV code and stepping into it: if all goes well you’ll be able to step into and around the OpenCV source code. Note: if you move your OpenCV distribution to another folder then the debugger will prompt you for the location of the OpenCV source files. This only happens once (as far as I can tell). 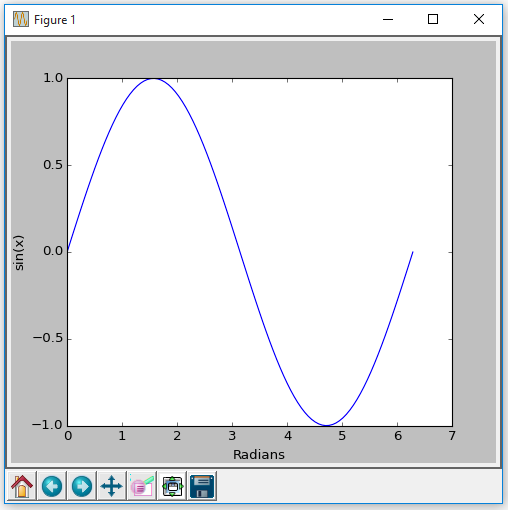 A good sample program to start with is Load and Display an Image, on the OpenCV website. After loading a VS2013 C# project in VS2015 I got the dreaded MSB3884 warning (Could not find rule set file). A little annoying since I wasn’t knowingly using code analysis (but I might now). On the project properties go to the Code Analysis section. Then rebuild – problems gone ! My shared folder drive mapping no longer worked after the November update of Windows 10. To fix this I had to manually uninstall VMWare Tools, reboot, then install and reboot again. (Using the Reinstall option from the menu didn’t appear to fix the problem). 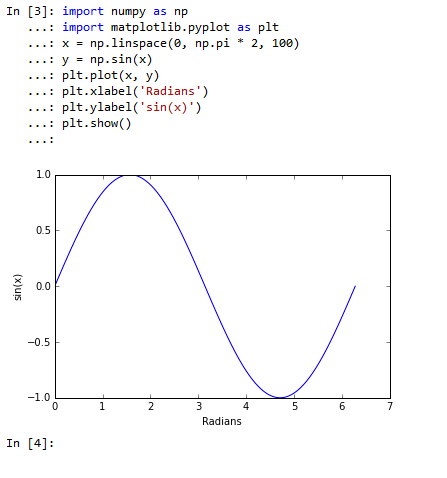 I’ve started working with Python (2.7 and 3.x) and OpenCV 3 recently, and the IPython Notebook way of working with inline plots is awesome. But the debugging, editing and some other features are not great when compared to working in a Visual Studio environment. 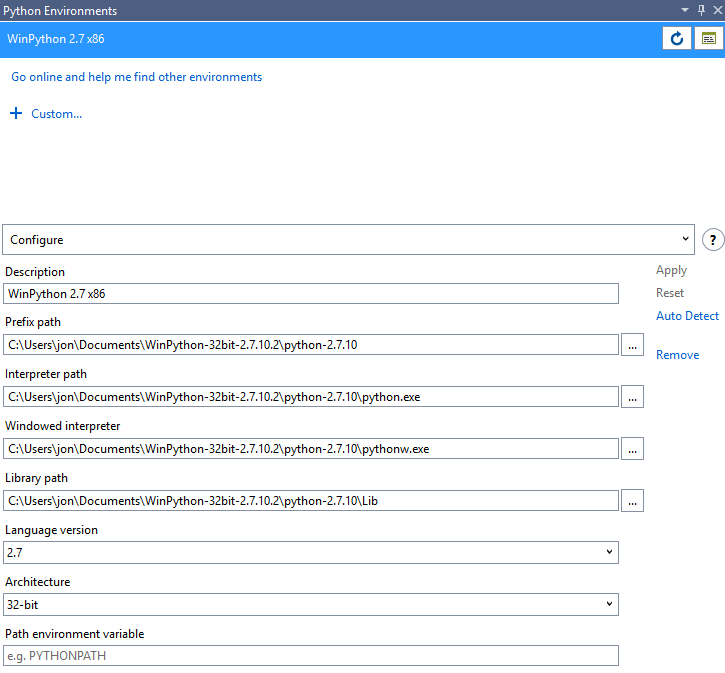 So now I’m trying Visual Studio 2013 as the IDE, OpenCV 3, and Python 2.7 via the numerical and scientific WinPython stack. 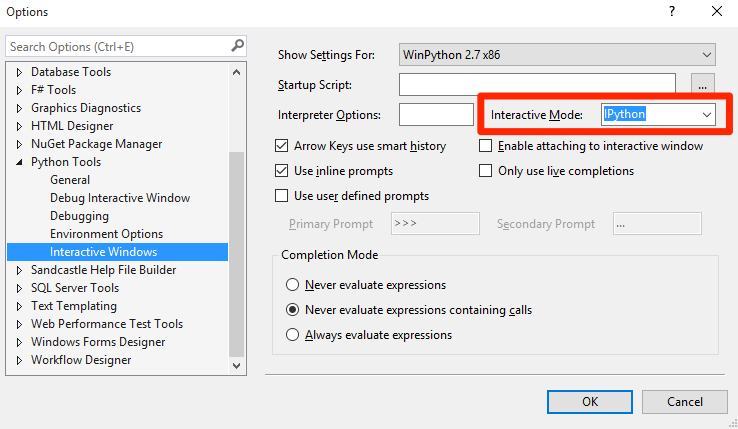 From VS2013 I then installed Python Tools for Visual Studio (PTVS).. I did this within VS2013 using the Extensions and Tools dialog. 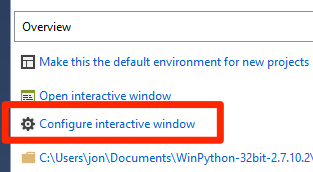 Python interactive window. Type $help for a list of commands.